The ACS Patient Page is a public service of ACS and free to all readers. The purpose of this service is to provide physicians with a resource that they can use to give patients clear and easy-to-read information on a particular topic published in the ACS. Each page provides links to other reliable health sites. 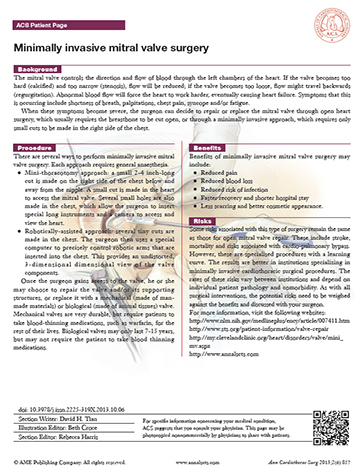 The ACS encourages physicians to download these pages and distribute them to their patients. Registration is not required to access the ACS Patient Page. The information and recommendations suggested on this page are appropriate under most circumstances. The ACS Patient Page may be printed non-commercially by health care professionals to share with their patients.